It's Boxing Day or it's just the day after Christmas, depending where you're from. I'm sure cooking is probably pretty far from your mind, but once you've put down your chocolates and leftover Christmas cookies, you will want to eat this salad. Well, unless you're a vegetarian or don't eat beef. You just might want to substitute in baked tofu or seared shrimp instead. But for the rest of us, this is one of those bold and bracing salads that isn't wimpy in the least. No doubt about it, this is a meal. The steak seals the meal deal here. Since I buy organic, locally raised beef, I love using skirt steak because it's a good affordable cut. It can be stringy and tough, but the key is to sear it quickly and serve it as rare or medium-rare as you like. After you cook the steak, let it rest for a good 5 or 10 minutes and then cut it thinly against the grain. I'm not sure how authentic this salad is, but this is a fresh and spicy, and the dressing takes it over the top. 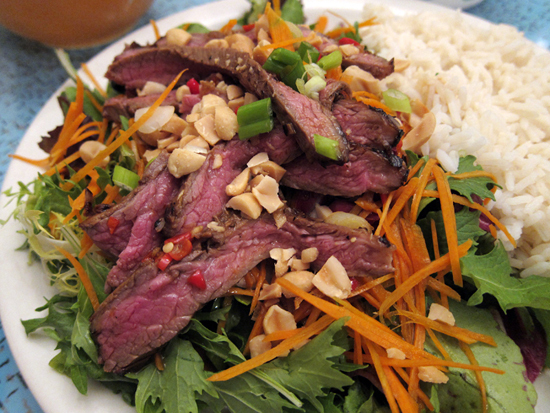 Rare steak gets piled on top of fresh greens and herbs which then gets tossed with the fresh lime-fish sauce dressing. Salty roasted peanuts crumbled over top and the refreshing crunch of carrots or cucumbers keep this salad well-balanced. Crunchy, salty, sour, spicy, a little bit sweet, this salad is guaranteed to wake up your taste buds for their chocolate Christmas coma. 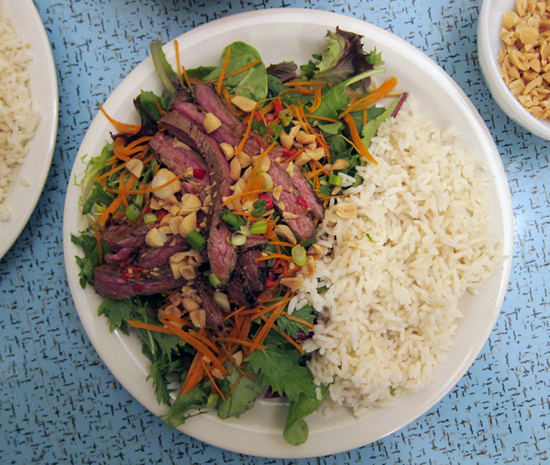 I like this salad served alongside some jasmine rice, which helps to fill out the plate while adding texture and bulk. Season steak with salt and pepper and grill over a bbq or in a very hot cast iron pan, about 3-4 minutes per side for medium-rare, depending on thickness. Remove from heat and let the steak rest on a cutting board for 5-10 minutes. 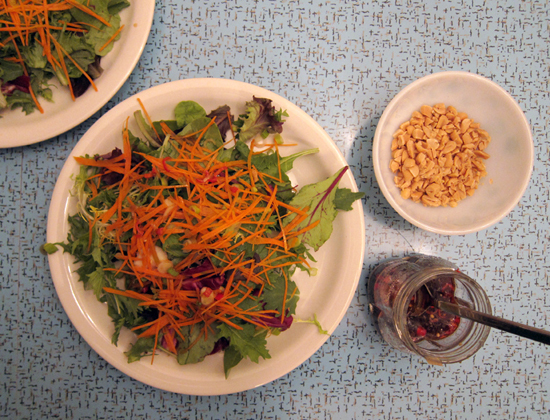 Mix up the greens and herbs in a large bowl and toss with the carrot. In a jar, combine the dressing ingredients together (from the chill to the water). Taste and adjust seasoning, if needed. Pour half of the dressing over the salad greens and toss well. Divide onto 4 plates. Slice the beef thinly, cutting across the grain. Combine any beef juices along with the rest of the dressing. 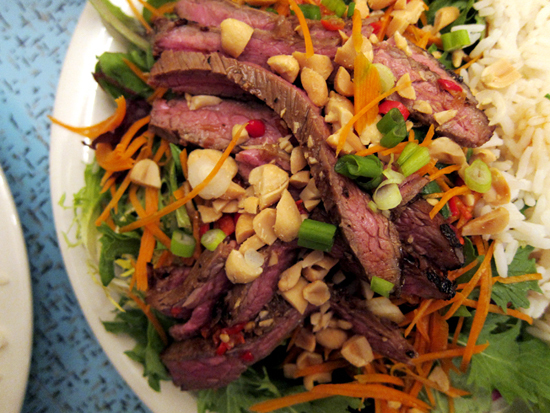 Lay slices of the beef over each salad, scatter with peanuts and green onions, and drizzle with remaining dressing. Serve with rice. Serves 4. One of my fav salads...thanks for sharing the recipe! looks and sounds great, jeannette! thai food really does have all the elements of deliciousness! !